Pork industry representatives from across Canada got a lesson about business metrics management in a growth environment from one of the leaders in the North American pork industry at the 2013 Banff Pork Seminar. Metrics are the measures of business performance. 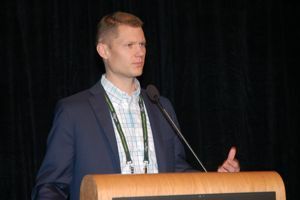 Jason Logsdon, CEO of The Maschhoffs, one of the largest family-owned pork production networks in North America says a well-crafted set of metrics are critical to translating business strategy into execution. And the pork industry today may not be focused on the right ones. "Metrics should start at the top with break-through targets that drive shareholder value creation and they should cascade throughout the organization so that each employee understands their impact on the entity's success," he says. "They should be simple, limited in number and should balance between lagging and leading metrics." In a growth business, shareholder value creation is much more about the future than the present, says Logsdon. The metrics should reflect this and capture the leading indicators of future success. These are not typical production or financial metrics but instead are measures of the future value- creating capacity of the entity's people, processes, systems, relationships and fixed assets. But he warns these types of metrics are harder to measure and sometimes cannot be captured with today's paradigm or today's information systems. A growth business must measure risk management and mitigation, as growth requires comfort that risk is being managed and that the balance sheet can support growth. It's critical to start with a business strategy when designing metrics, says Logsdon. "Our business has a strategy centered around innovating to create value for our customers. This allows us to grow our market share with our customers as they grow. To effectively measure success on the strategy, it's important we measure not just our historical operating performance but our capacity to grow." From his vantage, Logsdon sees three characteristics of good metrics. They flow through an organization. Senior management should have a limited number of metrics and in a perfect world the strategy can be measured in one core metric. From there metrics should cascade through an organization at each level and department. Ideally employee performance would be tied in some way to these metrics. While metrics cascade downwards, they start at the bottom of the business and roll upwards. Balance of leading and lagging, Leading metrics allow decision makers to solve problems and capture opportunities before they are major issues or lost opportunities. However, leading metrics don't have the robustness of lagging metrics. It's a challenge especially large in the pork industry where common metrics measure activities over the past 12 to 18 months. Less can be more. "Our business has suffered from a metrics gap," says Logsdon of his company. "Not too few, but too many which left employees confused and lacking focus. We recently trimmed the number of metrics significantly. This transition is not easy and it requires eliminating many 'sacred cow' metrics from our vocabulary." Shareholder value not only tells us if we are meeting financial requirements of shareholders but tells us if we are using society's resources effectively and efficiently, says Logsdon. "If we aren't meeting shareholder value, shareholders and bankers will stop investing in our business. So we can't accomplish our vision for ourselves or society." Return on Equity (ROE) and Return on Assets ROA). These are excellent measures of business success but have two fundamental flaws. They are both historical measurements and while they can do a good job of measuring business success over the long term, they can be misleading in shorter time periods regarding the business' future capacity to create value. As well, neither measures the amount of risk to achieve this return and efforts to maximize both could lead to increasing business and financial risk. Value per share. The ultimate measure of shareholder value addresses the shortcomings and captures the benefits of ROE and ROA. It is forward looking and takes into account risk. Independent evaluation. It's difficult for owners of a business to know whether an enterprise is creating value without getting an unbiased, professional, third party valuation. "It comes as a cost but it can be a great investment," says Logsdon. "In our business we conduct an annual third-party evaluation which we believe balances the cost and distraction of valuation within the value of knowing the score of the game." Logsdon believes in three core components of shareholder value creation. They are current cash flow, long-term growth rate in cash flow and the risk-adjusted discount rate. "As a growth business we are much less concerned about our current cash flow and much more concerned about the latter two factors," he says. One example of The Maschhoffs' commitment to follow through on business principles is how it has reduced risk. To diversity their portfolio, they do not always invest available resources in agriculture. To reduce their leverage risk, they set up a private equity group and this led to investments out of agriculture. "Growth occurs at the trough, not at the peak," says Logsdon. "We want the opportunity to make big investments at those troughs."